Judges from across the state gathered at Montgomery Bell State Park in early March for the first Tennessee Judicial Conference of the year. The five-day conference provided judges the opportunity to participate in continuing legal education (CLE) courses related to relevant issues affecting Tennesseans, including the opioid epidemic, as well as reconnect and network. Following the opening remarks, the opioid crisis took a front seat at the conference, as judges participated in the CLE: The Opioid Driven Addiction Crisis: Drug Addiction and Practical Solutions. Judges were able to hear from Judge Duane Slone, Pat Levitt, Ph.D., and Howard Burley, Jr. M.D., who all focused on varying subjects within the opioid epidemic. Judge Slone, who recently appeared on the Today Show with Megyn Kelly to discuss drug courts, focused a portion of the CLE on understanding the scope of the epidemic, why people become addicted, their behavior, and how the judiciary should appropriately respond. Relaying his personal experiences working with the successful TN ROCCs – Tennessee Recovery Oriented Compliance Courts –docket was a valuable insight to the attending judges searching for ways to combat this crisis. TN ROCCs is “a dedicated docket for offenders who’ve been assessed as having a substance use disorder and/or mental health disorder and are considered low risk for recidivism but still have high need for substance abuse/mental health treatment options.” This docket allows judges to serve and impact individuals suffering from opioid addiction. Dr. Levitt also presented on connecting early and adolescent development with an emphasis on the ingredients for successful adult outcomes. His presentation focused on the fascinating neuroscience in infants and young children in regard to how their brain development in early life relates to the decision-making processes these children make in their later adult years. Dr. Howard Burley, Jr. wrapped up the CLE on opioids with his presentation on medicated-assisted treatment, which delved into specific pharmaceuticals that could be facilitated as assisted treatment in conjunction with counseling and therapy. The three-pronged presentation on opioids was then followed by an opioid task force panel, which took questions from judges. The panel consisted of Judge Slone’s team, who work hands-on with TN ROCCs, and representatives from the Tennessee Department of Mental Health and Substance Abuse Services and the Office of Criminal Justice Services. The remaining CLEs at the TJC focused on creating better solutions to the immediate problems the citizens of Tennessee are experiencing with an emphasis of current issues judges are facing. Sessions focused on access to public records, judicial ethics, workplace harassment, and trauma experienced by individuals who find themselves within the court system. The CLEs were led by fellow judges, doctors, and professors. The “#YouToo! Not in My Court!” CLE relating to the “MeToo” movement was presented by Tim Discenza, disciplinary counsel for the Tennessee Board of Judicial Conduct; Jay Ballard, deputy attorney general in the civil litigation and state services division at the Tennessee Attorney General’s Office; and Rachel Harmon, AOC general counsel. The TJC wrapped up with two CLEs on ethics, led by Judge Kelvin Jones, chair of the American Bar Association’s Judicial Ethics & Professional Committee, and University of Tennessee Law Professor Paula Schaefer. There was also a CLE on Vicarious Trauma in the Court—Identifying Problems & Resources, led by William D. Kenner, M.D. Recognition was also given to Tennessee’s newest judges: Carter Moore, Angelita Blackshear Dalton, Barry Tidwell, Kyle Hedrick, Wyatt Burk, and Jennifer Nichols. Congratulations were given to newly retired judge, Jim Beasley. Judge Joe Riley and Judge Steve Stafford also delighted the crowd of judges by giving a hilarious presentation during the Golden Gavel Awards. To view photos of the spring TJC, please visit our album on Flickr. 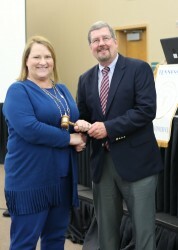 New judge Jennifer Nichols receives her gavel from Supreme Court Chief Justice Jeff Bivins.